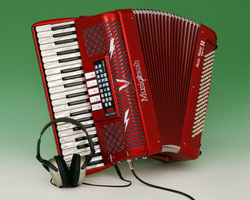 AN EXTRA-LIGHT, STANDARD SIZE ACCORDION with touch sensitive piano or chromatic keyboard. Only 11 lbs (5 Kg) of weight for such an impressive sound. Available in different colours. Blue, black, red or white. All the accordion component parts made entirely in Castelfidardo. 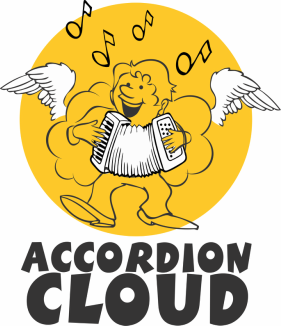 Same characteristics as Music Maker but already installed in the accordion and ready to play. The Music Maker Digital 50 is the most complete Digital Accordion that the accordionist could ever wish for. Incorporating the famous Music Maker (Midi Interface with integrated Digital Sound Module) that enables the player to perform practically any kind of music, thanks to the Digital Sounds selected by the World�s top professional accordionists. There are 75 different Preset Performances already memorized in the "Flash Memory" all using digitally sampled sounds, unrivaled in their sound quality and reality, of which 25 are exclusively accordions. Another 25 performances contain Strings, Choirs, Organs, Guitars, Brass, etc., and a further 25 Professional Gig Sounds are arranged in groups and programmed with right hand and left hand dynamics. All the presets can be re-programmed by the user to satisfy the requirements of even the most demanding musician. Incorporating remarkable Dynamic Bellows Expression control, reputed to be the best available, adding that extra touch of class and making the difference between a good performance and an outstanding one. Control of external sound modules is made possible by means of the Midi Out of the Midi system, enabling further combinations of sounds and arrangements. 2 headphone sockets, extremely useful for playing without causing disturbance to your neighbours, or also for music schools (teacher and student). Same characteristics as the Music Maker Digital 50 but with the addition of an internal amplification system specifically designed with a frequency response suitable for the sounds of this accordion. Power can be by means of the small external battery with convenient belt clip (enabling quick substitution in case of discharge) or from the suitably designed power supply. Input jack for external audio devices (MP3 player, iPhone etc.) to enable playing with backing tracks. Line Output jack ( for connection to an external amplifier or mixer). Headphone output jack with automatic exclusion of the internal speakers. Output power of the integrated amplifier is 8 + 8 W RMS with due specially designed high efficiency internal speakers. Frequency response of the amplifier specially designed to give high quality reproduction of the internal sounds. 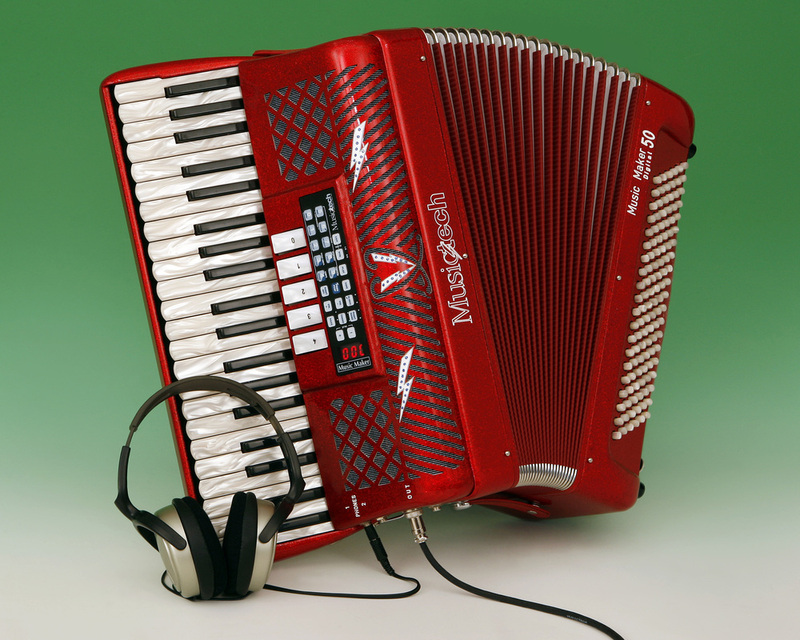 AN EXTRA-LIGHT, STANDARD SIZE ACCORDION with touch sensitive piano or chromatic keyboard. Only 11 lbs (5 Kg) of weight for such an impressive sound. The Wireless System let you play in totally liberty. Any model can be supplied with the wireless TRX system. If buying an accordion we offer a promotional discount of £100 off our price of a TRX radio system.